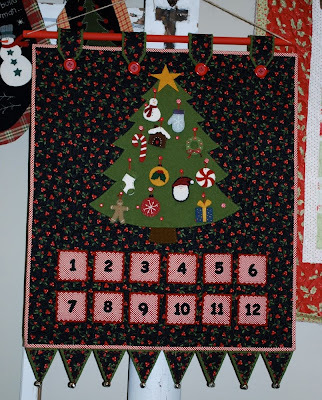 Finished size is approximately 28" x 37"
This Christmas Advent Calendar we recently did a post on and then we realized that we forgot the larger version. Both sizes are included in the pattern. This is the twelve days before Christmas size. 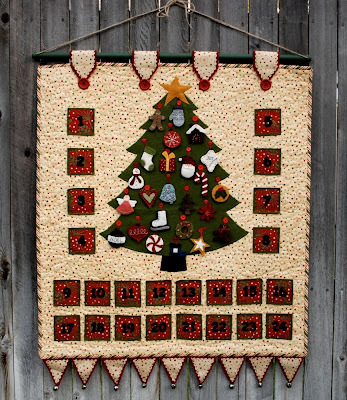 Finished size is approximately 32" x 40"
This larger size has 24 pockets to hold 24 ornaments so you can place one ornament on the tree up until Christmas Day. Mindy and I drew up the pattern for the ornaments in July. Then Mindy stitched fast and furiously to get the advent calendars done for market in October. They are really cute advents using cotton and felted wool accents. The tree, ornaments and the tabs are all finished off with wool. They are all really traditional so you can enjoy them for years to come. We will not be making kits for the advents. We do have the wool that you can purchase for the tree, tabs etc in the shop. That way you can mix and match the colors of wool depending on your cottons that you are using for your backgrounds and pockets. Oh Amy that is so cute. I've always wanted to make an advent calendar. I love it. 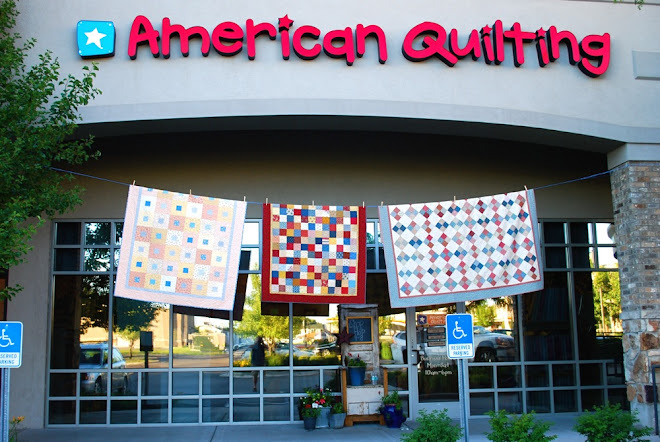 I made a new sample quilt for the retreat and I'm bringing it over this week. Sorry it has taken me a bit. Those are really cute. I love the idea of hanging an ornament everyday. Amy, I've been searching for years to find the advent calendar from my childhood. This is the closest one I've found. Do you think you'll have this pattern in stock again this year?